Unclaimed property compliance is an especially critical issue for banks because it typically involves the institutions’ number one asset: customer relationships. In today’s challenging economic environment, it is too costly to lose customer accounts due to escheatment or to struggle to stay in compliance with the rapidly changing escheat rules by state. Adding to the challenge, states are increasingly utilizing unclaimed property audits to enforce their laws, ensure compliance, and cover short-term budget gaps. Unfortunately, many operations teams are stretched too thin and lack the specialized resources to maximize account retention by locating and assisting lost customers. Keane is the industry leader, offering the specialized dormant account owner location services and assistance that banks need to protect customers and keep account escheatment to a minimum. We have helped protect hundreds of millions of dollars in banks assets from escheating. That’s one of the reasons why we’re the number one choice of the banking industry. Keane’s ability to locate lost customers and reactivate dormant bank accounts is unmatched. Our success in protecting these customers produces bottom-line benefits for our clients. We help them control administrative expenses, reduce due diligence mailing volumes, and minimize the cost of fulfilling unclaimed property reporting requirements. We are uniquely experienced in both the unclaimed property and banking industries; so our professionals understand bank products, operational and retail needs, and how to efficiently reduce escheatment challenges. Keane is the only comprehensive provider of unclaimed property services in the country and the leading provider of dormant account owner location services to the financial services industry. We stand ready to complement the efforts of your team, or develop a complete outsourcing solution. We offer customized programs that help you comply with state and federal rules, while protecting assets and strengthening consumer relationships.  For more insight on unclaimed property within the banking industry, visit our Unclaimed Property Blog. Questions? Call us today at 800-848-8896 to speak with an Unclaimed Property specialist or send us an email at questions@KeaneUP.com.